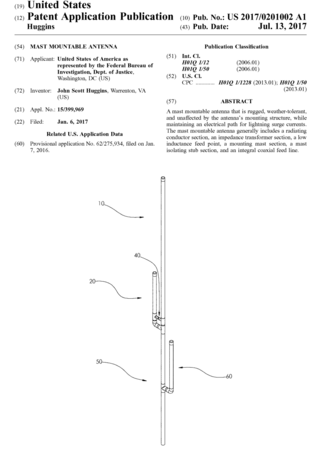 Another click of the USPTO’s rusty ratchet yields the publication of my patent application concerning the taming of mast currents from the ubiquitous J antenna by use of a mast decoupling stub. This patent process has been going on for quite some time. July 13th, 2017 – Non-provisional utility patent application US20170201002A1 published by the USPTO. It will likely be another couple years before the next action by the overwhelmed USPTO. Living long enough to see a patent through the process is almost as hard as writing them. We received notice from the USPTO concerning the above patent application. Rejection of course with reasons laid out. Pretty normal. Now onwards to defense.